How many times have you caught yourself thinking "Why aren't there slippers for your hands?" Dozens of times, right? Now, some of you might argue that gloves or mittens are slippers for your hands and to those people we say, enough of that crazy talk! Hand slippers are what we're talking about: a nice and cozy place to put your hands when it's cold. Makes perfect sense. But how can you get your kid to wear his or her hand slippers? Kids hate slippers probably! Well, these dinosaur hands and feet will be the perfect trick! Every kid loves dinosaurs. It's basically a proven fact. 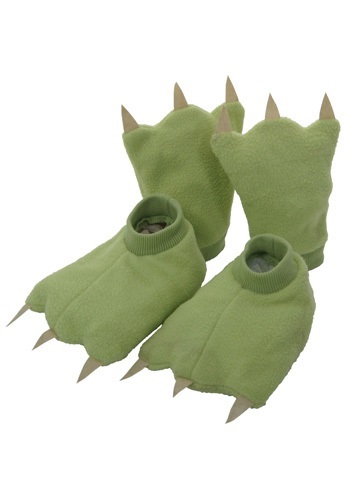 And they'll love slipping these on while they stomp and roar around the room. Little will they know that you've just tricked them into wearing slippers! Nice one. That's why you're the World's Greatest Parents. Because you think of fun and creative ways for a kid to keep their hands and feet warm. Now get out there and teach that kid how to do the perfect dinosaur roar! Decent for the price. Color and quality much poorer then product picture.